A total of 1,431 people received cash fines in Macau in the first 10 months of 2018 for smoking in unauthorised areas inside the city’s casinos, according to government data. That is an increase of 83.7 percent from the prior-year period, when a total of 779 people had been fined, show official data released on Wednesday. Statistics from Macau’s Health Bureau indicated that a total of 725 site inspections were conducted inside casinos between January and end-October – up from 560 inspections in the first 10 months of 2017. In its latest press release, the bureau said fines for smoking inside casinos accounted for 30.5 percent of the aggregate number of incidents involving smoking in prohibited areas as recorded in the first 10 months of 2018. 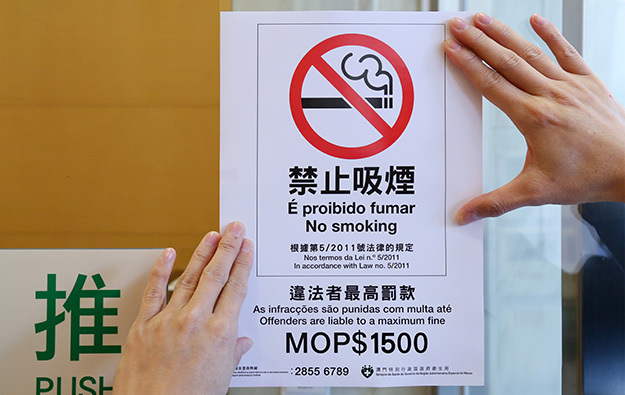 The Health Bureau said additionally that during October it had noted higher incidence of smoking cases in a few locations, including at casino hotel Sands Macao, operated by Sands China Ltd.